The game Ghettopoly is a multi-player parody of the Monopoly game that is based on life in the ghetto. All of the properties and spaces on the board have been renamed to be ghetto themed, except the Jail space which pertains to the ghetto anyway. Though the game Monopoly is for ages 8 and up, I would not recommend this game for anyone below the age of 13 because of all the Ghetto and sexual references. Ghettopoly board game is played the same way Monopoly is. There are 2 to 7 players (Monopoly is 2 to 8 players) and each advance around the board purchasing properties and collecting money. The game pieces are changed from a dog, a boat, a thimble, a horse, a car, a top hat, a boot and a cannon to a prostitute, a pimp, a crack rock, a machine gun, a 40oz, a basketball and a marijuana leaf. Property names have changed as well. For example, instead of railroads, there are liquor stores. This game is an unauthorized parody of Monopoly which led the creator, David Chang, to be sued by Hasbro. The game was also named offensively racist by the NAACP, which resulted in copies of this game being pulled from the market by Urban Outfitters. 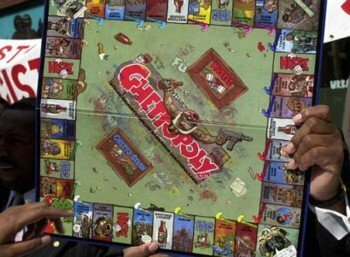 Monopoly players will find the Ghettopoly board game simple because of all the similarities, but as mentioned before, this game should not be played by children under the age of 13. The use of liquor stores, prostitutes, pimps, alcohol in general and other ghetto references could seem racist and offensive to some people, but a good laugh to anybody with a sense of humor. This game is not to be taken as a literal example of life in the ghetto, but a humorous example of the media’s example of the ghetto. However, this game could very easily lead children to believe that being a pimp, using a gun and having a lot of prostitutes is a good thing and we don’t need any more of that in today’s society. 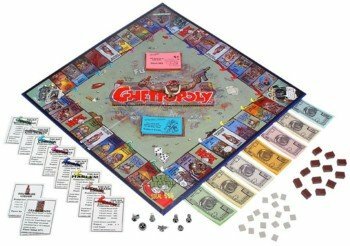 The Ghettopoly board game is very similar to Monopoly, but its distinct differences make it stand alone. It brings a bit of comedy to today’s uptight society and shows how quick censors are to pull it off the shelves because of a hint of racial slur. Though it was illegally manufactured, I feel that we need more games like this just to bring something else to laugh at. David Chang had the right idea, if only he’d done it with permission. Since it’s ..OUT OF PRINT…. Does anyone know where I can get this game? May 06, 2013 Come one people…..
Come on now people. I can’t believe you are all being so ridiculous about a game. You say it’s offensive and racist… I guess you all live on another planet than most bc this game simply takes THE TRUTH about our world that we live in and makes into a board game. YES I said it..it’s just a board game, it’s not personal! If you are offended about a game how do you live in the real world? Hasn’t anyone ever lost some money on wall street from a bad broker? What title would you give him? Or is that ok because he screwed you over and basically ripped off your money on some stocks with some bad advice, BUT that’s ok because he wears a suit? That wouldn’t make him a con artist or even a pimp? Hmmmm. Maybe a few people just need a new hobby? lol. It perpetuates terrible stereotypes and I can’t imagine whoever is profiting from it is a good person. Jul 13, 2010 Crack-up game! Having played many variations of the standard monopoly I thought this would make a humourous change,and,I wasn’t disappointed.Ive played many games with my teenage boys and we have had discussions about some of the terms used and so it has been an education for all off us and,as I stated before,a heap of fun.Its a game after all and needs to be played with that in mind and if you’ve brought your kids up with the right attitudes this game will not be a problem.So roll the dice….